If you’re looking for a superabrasive that can withstand high temperatures while maintaining a high degree of accuracy, a CBN grinding wheel may be the perfect solution. And at Eagle Superabrasives, we stock an impressive inventory of over 6,000 diamond and CBN grinding wheels at our Hickory, NC location. As a leading supplier of superabrasives in the country, we’re sure to have the grinding wheel you’re looking for. A CBN grinding wheel gets its name from the cubic form of boron nitride that coats the wheel. This element, also known as a Borazon crystal, is one of the hardest materials on earth. The crystal forms when boron and nitride join together at 1800 degrees Celsius. Borazon has a number of uses. It can be used to create cutting tools, compressor parts, fuel injectors and surgical knives. Because Borazon can withstand high temperatures, it’s ideal for use in the automotive and aerospace industries. But when bonded to a grinding wheel, Borazon can outperform a superabrasive industry standard: the diamond grinding wheel. Diamond wheels were the preferred abrasive for grinding hard superalloys. But because of diamond’s carbon makeup, diamond grinding wheels would often dissolve iron at high temperatures. Borazon doesn’t contain large amounts of carbon, making CBN grinding wheels an ideal alternative for grinding hardened steel tools. But because a CBN grinding wheel can maintain high levels of accuracy while still removing high amounts of material, the wheel became a preferable alternative to diamond wheels. Today, a CBN grinding wheel is ideal for machining hard ferrous metals, nickel-base superalloys and cast iron. Jewelers will also use a CBN grinding wheel for jewelry making. The wheel can accurately cut metals, glass and even diamonds. The only limiting factor of a CBN grinding wheel is the breakdown of the bonding agent. The separation of the bonding layer from the metal core will often shorten the wheel’s life faster than the wearing down of the cutting surface. However, Eagle Superabrasives uses advanced bond systems and six types of core materials to make sure our wheels last longer. Depending on the intended application, a CBN grinding wheel can feature a hybrid, resin or vitrified bond. Don’t settle for less. 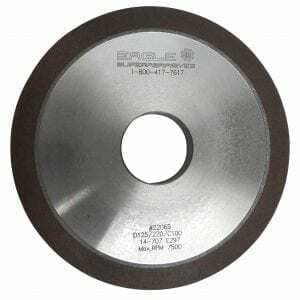 Trust the experienced professionals at Eagle Superabrasives for all your grinding wheel needs. Contact us today to get started!